This time of year is perfect for cozies. There is a chill in the air, the leaves are changing colors and falling from the trees, and there's a general sense of good will in the air. Mostly, anyway. Rita Mae Brown's Litter of the Law is a perfect cozy for the Halloween season, set in small town Virginia. This was my first Rita Mae Brown mystery, believe it or not. I have not read all that many cat mysteries, despite what my blog name may suggest. I thought it was cute that the author's cat earned a spot on the cover as a coauthor, her contribution to the book being the animal conversations and activities, something which took me awhile to get used to. I'm not used to cats, dogs, birds, mice and foxes talking--at least not in a book like this. It grew on me though and by the end, I didn't mind so much. It was comic relief. The novel seemed to get off to a slow start. Much time was spent setting the tone and atmosphere of the book. Even after the first body is found, the mystery took its time unfolding. It was nice change from the more fast paced books I've been reading. A breath of fresh air. Cozies tend to be like that for me. Harry and I hit it off pretty quickly. I love it when the heroine is close to my age. I also could relate to Harry's love for animals. Harry is not one to sit still when there is something to be done, nor will she keep her nose out of trouble when something isn't right. After finding the body in the cornfield, Harry does her own digging, and the crime becomes more personal when someone she knows is targeted. There's always a risk of an every day heroine's involvement in an investigation seeming too unbelievable, but it made sense in this instance. Harry was just one of the many characters in the novel, each character very much their own person. I especially liked Harry's husband Fair and Tazio, a young architect with a sense of history and culture. 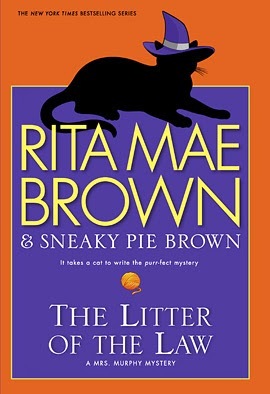 In Litter of the Law, Rita Mae Brown brings attention to a very real issue that I think is worth noting (and the author does too, given she's written about it), and that is the fact that the federal government refuses to acknowledge Virginia Native American tribes, as a result denying these tribes legal standing, being able to claim historical and cultural artifacts and gaining access to federal programs that other recognized tribes have access to, among other things. Tribes long discriminated against continue to be victimized in this day and age. 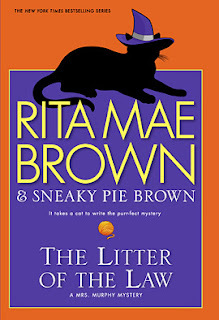 I enjoyed reading Litter of the Law, and am eager to read more by Rita Mae Brown. You can learn more about Rita Mae Brown and her books on the author's website. Source: Review copy provided by publisher via NetGalley. Loving the sound of this and what a great cover. I'll be sure to keep a look out for this one. Tracy - I like the cover too. :-) This was an enjoyable book, a nice little escape. I like this series partly for the setting. My husband's family doesn't live far from Crozet so I know all the places she writes about. Kathy - How awesome is that?! I love it when I read about a familiar place. I love this series! I stopped several books ago but I do have them all in my TBR. I just haven't had time to get back to reading them. Oh, good! I have this one on my Kindle, and I'm glad to know you enjoyed it. Jenclair - I hope you like it when you read it. As I said, it got off to a slow start for me, but I'd just read a couple fast paced books that it was a nice change.